Statements made in Indian media by Indian Steel Minister Beni Prasad Verma after he met with Energy Minister Simon Bridges on 30 January indicate a clear expectation of some kind of deal between the two Governments on coal, said the Coal Action Network Aotearoa today. 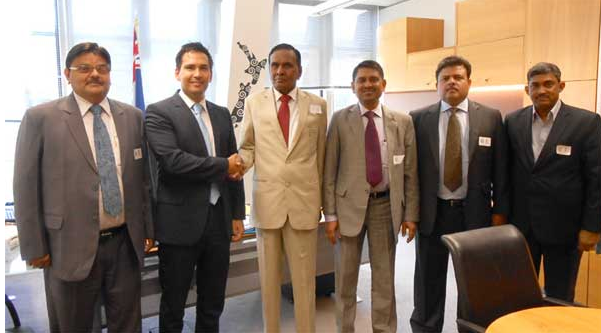 “We are looking forward to the Government of New Zealand for allocating mineral assets to Indian public sector companies on a Government to Government basis,” said the Minister in an official press statement after the meeting with Bridges. Today in the House Steven Joyce, on behalf of Simon Bridges, denied that any promises had been given, but refused to rule out sales of coal mines to the Indians. The “asset” likely to be of most interest to the Indian steel industry would be Solid Energy’s Cypress mine at Happy Valley on the West Coast, where the company has now begun work to remove the “overburden” of the West Coast habitat that has lain idle for several years. Solid Energy also owns permits for seven other, as yet undeveloped coal mines, four of which contain the coking coal for steel the Indian Government delegation was after. “The last thing NZ needs, in this era of impending climate change, is a powerful overseas company with an insatiable appetite for coal, entering our country. It would clearly not stop at just one mine,” said Coal Action Network spokesperson Jeanette Fitzsimons. “Coal Action Network is opposed to any new mines opening in New Zealand, and wants to see a gradual phase out of coal mining as the mines deplete and the miners retire”. “New Zealand has a wealth of opportunities to invest in clean energy that will not change the climate or damage workers’ health. That should be our priority,” she said. More than 80% of India’s coal is produced by state-owned Coal India (or its subsidiaries), which has a reputation for breaking environmental regulations – the reason the company’s growthdropped to two percent in 2010. 342 mine deaths were recorded in the four years to 2012 in mines operated by Indian Government-owned coal companies. The Pike River mine was partly owned by Indian coal companies, who had four representatives on its board. “Given the Indian coal industry’s terrible environmental and safety record – would you trust them to operate safely in New Zealand’s environment?” asked Ms Fitzsimons.